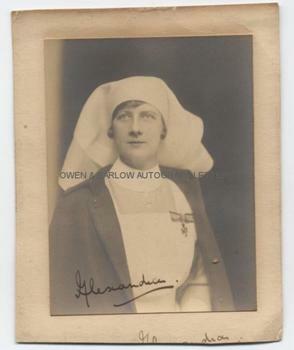 PRINCESS ALEXANDRA DUCHESS OF FIFE Photograph Signed. Princess of the House of Saxe-Coberg and Gotha. Consort of Prince Arthur of Connaught. Daughter of Prince Louise of Wales. Photograph, signed on image by Alexandra. An informal snapshot showing the Princess in nurses uniform and wearing the Order of the Royal Red Cross. The photograph measures approx 4 x 3 inches (excluding mount) and is mounted on card. The mount bears evidence of having been trimmed at foot and it appears that, at one time, there was also a signature of Alexandra on the mount below the photograph. This second signature is now only partially remaining. In very good condition. The Royal Red Cross is a military decoration established by Queen Victoria and which was expanded into two classes in 1917, during World War One. It is awarded to fully trained nurses who have shown exceptional devotion and comepetency during actual nursing services or who has performed some exceptional act of bravery at her post of duty. 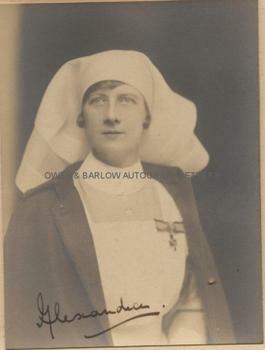 During the War, Princess Alexandra had served as a nurse at St. Mary's Hospital, Paddington. In 1920, when Her husband, Prince Arthur of Connaught was appointed Governor-General of South Africa, she accompanied him there and continued to work on behalf of local hospitals.